Pretty sure the Phase II clone’s gonna win, hey! He’s the only one with wheels! Yea, and it is the “Turbo Tank”… Every time I look back at this shot I hear the “William Tell Overture” in my mind. Ha ha. This one is really great. 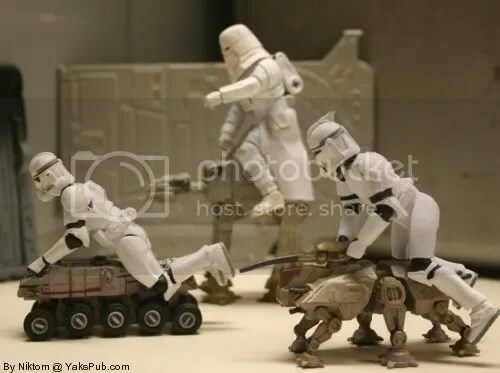 I love the Snowtrooper riding the ATAT like a little pony. And yeah, I’m pretty sure the Turbo Tank guy is gonna win this. Lol I had to look up the William Tell Overture, but now I see what you are talking about! Ha ha ha ha ha… for those who don’t get this, check out March 20th.